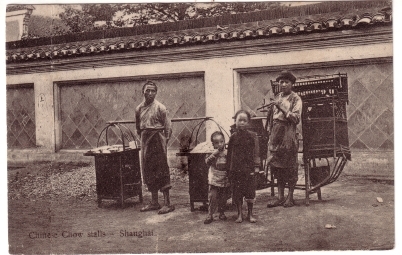 Caption: Chinese Chow stalls -- Shanghai. Action: Two examples of ambulatory restaurants in Shanghai. The left one, made of two chests loaded with food, crockery and chopsticks, is carried on a bamboo pole; the other is a whole frame with the same items, a stove and a stool, carried over the shoulder. Two children pose for the photo in front of a tile-faced wall. Image Particulars: The men will stop whenever they are hailed, prepared what is requested and serve it on the spot.